Yesterday in the mail, I finally got that thing that made me feel completely Canadian, at home among these quiet yet docile creatures of the North. I received my BC CareCard, giving me access to unlimited health care. Oh, the awesome power I now wield! Earlier tonight, a friend called me up though it was quite late—it was about 12:20 a.m., in fact. It reminded me of high school when staying up late was actually more common among my friends than it seems to be now. I have to say—I really enjoyed it. Flickr, the online photo-sharing service, has a nifty word chart of what the most popular tags used are. But they’re arranged in a big block, and I wondered what they’d look like if they were sorted by size. So, I did that. I put the font size after the item, so you can have a slightly better idea of its relative importance. Also, I love the fact that Flickr lists the top 145 tags. Top 145? 150 was too extreme? Travel Plans: Hawaii, L.A., N.Y.
I’ve been spending a fair amount of time with Jason and Noriko recently. You know how once someone gets on your bad side, nothing they can do is right? Well, Rogers Cellular just pissed me off again. They charged me a late payment of $0.90. The online photo site Flickr lets me to see how many photos I’ve taken on my camera. So far, it’s a little over 1,800 since Dec. 25, 2004, and that’s 76 photos a day, on average. I’m definitely a little photo crazy. What’s your photo count? 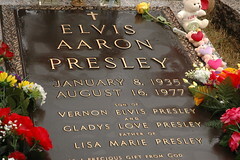 I took a trip to Graceland recently, and here are my photos from it. The house was modest, but impressive nonetheless. This was the only tourist stop I made in a long journey across the U.S.—I think if you have to stop only one place, this had better be at the top of your list.